NRAD is humbled to have been recently honored by our peers for our community outreach programs and community involvement. 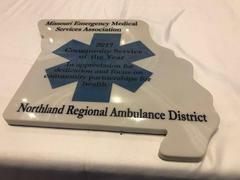 The annual service award recognizes ambulance districts for dedication to and focus on community partnerships for education, prevention, recognition and treatment that improve the overall health and well-being of our citizenry. 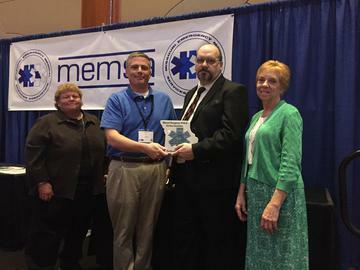 Executive Director Scott Roy and board president Charlene Bruce accepted the award on behalf of the employees and directors at a recent MEMSA conference. “I am very grateful to our many collaborative partners who help us get out into the communities we serve and provide outreach to recognize, prevent and treat life-changing medical events," Roy said. "I would like thank Saint Luke’s North for their years of commitment in assisting us with stroke recognition and cardiac arrest awareness programs, as well as our hands-only CPR initiative," Roy continued. 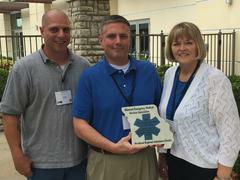 "The Platte County Health Department, the school districts we serve, and many others too numerous to name here have contributed so much in helping us develop our involvement in our communities. MEMSA (Missouri Emergency Medical Services Association) is a nonprofit, statewide, professional association committed to high quality emergency medical services across Missouri. Since 1983, MEMSA has provided leadership in education, training, and pre-licensing EMT and EMT-P practical testing as well as legislation.